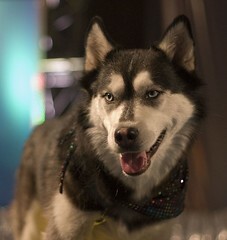 Ok, so it's a Husky Dog, but we have a joke around these parts which makes it an Indian Dog, so there! I'm still waiting for my work visa to come through. I have a new three month contract with work which actually starts soon and I have to apply for a work visa for that particular contract. I am just taking everything one day at a time and not worrying too much. I think I am getting used to it now! I just bought a new camera flash with a lightsphere attachment and a new 28-75mm lens for the Toronto International Film Festival which is coming up soon. I will hopefully get some great shots this year! Everything I am buying these days has to be portable incase I get what I refer to as "the letter of doom". Every weeknight I come home from work and check my mail for said letter and hope I don't have to return to England. Part of me wants to visit England to see everyone etc., but I can't even visit the US with my current status. Wish me luck!